Melissa Gifford - Independent Stampin' Up!® Demonstrator: Happy Glittery Birthday! Hello everyone, I have another card to show you today. This one showcases the Frosted Floral designer series paper from the 2018 Holiday Catalogue (page 37) It's a bit hard to see in the catalogue but these papers have a beautiful pearl effect as the patterns are printed on shimmery paper. It gives it a luxurious look and feel. This panel style card is one I love to use when I don't want to cover up the beautiful papers! I simply cut the paper into strips then stuck them to the card base - in this case blackberry bliss. The Happy Birthday is cut in sparkling glimmer paper using the Happy Birthday thinlits from the annual catalogue. I find the easiest way to attach this is to use the multipurpose adhesive sheets. Attach the cardstock to a piece of adhesive sheet and then run it through the bigshot machine. Then all you need to do is remove the backing and attach it to your card. Saves messy glue leaking out the sides! The sheets are fantastic for small and intricate dies. 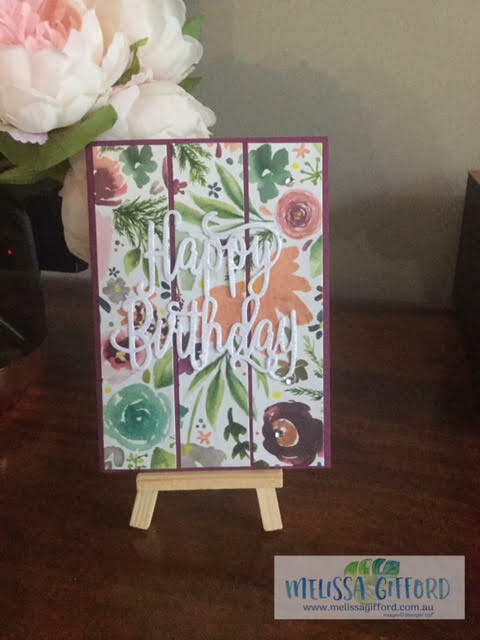 This is another less-is-more style of card - easy to make a few of quickly to have on hand for those birthdays we sometimes forget!